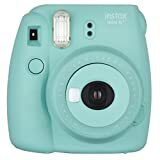 Amazon has the fujifilm instax mini 8+ (Mint) instant Film camera + Self Shot Mirror for selfie Use - International Version (No warranty) for $72 with free shipping. Sells for $73+ Highest Price. Deals for $66 Lowest Price. Normally $69+.